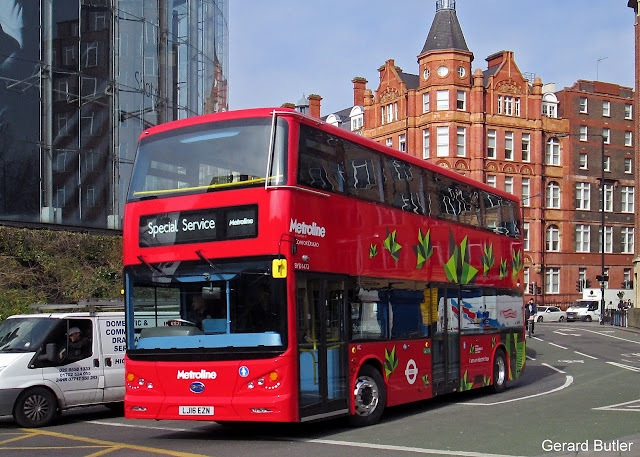 Yesterday (8th March) saw one of five brand new Chinese built BYD all-electric double-deckers prowl quietly through the streets of London, albeit on test. Metroline Travel's fleet number BYD 1472 (LJ16 EZN) was captured by Gerard Butler as it circumnavigated the main roundabout on the south side of Waterloo Bridge. The intention is to operate the buses on Transport for London route 98 (Willesden & Holborn), alongside Volvo B5LH type out of Willesden (AC) Garage where the necessary charging infrastructure has been installed.